It is a tall, tufted, perennial, scented grass with long narrow leaves. 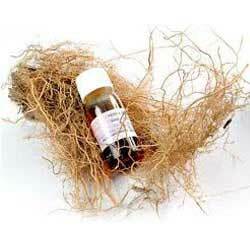 The oil is obtained from the root by distillation. It has a long-lasting woody fragrance. Vetiver oil has various chemical compounds that include benzoic acid, vetiverol, furfurol, vetivone, vetivene and vetivenyl vetivenate. Specific Gravity : 0.99200 - 1.04200 @ 25°C. Antiseptic, antispasmodic, depurative, rubefacient, sedative (nervous system), stimulant (circulatory, production of red corpuscles), tonic, vermifuge. Vetiver oil strengthens the central nervous system and is helpful in overcoming depression, insomnia, anxiety, stress, tension and nervousness. It also helps in curing nervous system, acne, arthritis, cuts, depression, exhaustion, insomnia, muscular aches, oily skin, rheumatism, sores, stress, skin care, aged skin, anorexia, immune system, insomnia, nervousness, high blood pressure, calming and deeply relaxing, eases muscular cramps and improves immune response. It is a popular ingredient for soaps, toiletries and perfumes. Vetiver is known to the world of perfumes, and its use in scents (attar) is known in India much before the world became familiar with rose scents.